I was wanting to write this post for a long time but was not able to write. But Today I will be sharing with you the essential WordPress Plugins for your blog and WordPress website. I think for you WordPress need no introduction if you are looking for the essential WordPress Plugins but still, if you want to know a little more about WordPress and know the reasons to use WordPress then check this post on “Why to Use WordPress?” I will be sharing with you those Plugins which I have used and have good experience of using them. And even will be taking the help of my friends to share some of the best and essential WordPress Plugins which they have used. A plugin can be known as the software which can add extra functionality to your WordPress website. A plugin can enhance the features of a WordPress theme, or you can completely add a new feature to your WordPress website. Different plugins add different functionalities to the WordPress, and in this post, I will be sharing with you the plugins which will help you to make your Blog better and well optimized. This is the plugin which you will get when you install your WordPress on your web servers. You would have noticed that whenever we install WordPress, there are two plugins already available that are “Akismet” and “Hello Dolly.” But Akismet plays an important role and saves you from a big headache. When the bots or spammers make comments on your blog, it filters out those comments and put the spammy comments in the spam folder so that you can also manually check if there isn’t any actual comment gone into the spam folder. I have been using this plugin for the day I started blogging, and this plugin has never let me down and has saved me lots of time. Akismet plugin is created to stop the comment spam only, but the clean talk is far more ahead than that. If you are using it then you need not worry about the existing spam comments, or coming spam comments, registration spam, it also stops spam widget and subscription to your blog. But the only thing is that It is not available for free, you can try it for free for few days, but then you have to pay $8 per year which is a small amount. How to get rid spam emails and spam comments? Now, this plugin is created to protect your email Addresses from the email harvesting robots. I must say that it is one of the essential WordPress plugins if you don’t want to receive spammy emails in your inbox. Well, this is my favorite part. Because I have spent five years in the field of SEO only. There may be many Plugins for SEO, but I will be sharing which works best. I think more than half of the Blogger will be using the Yoast SEO plugin. There are many things to share about it, but I will share the essential ones only. It give us the opportunity to write better content, do proper On-page analysis, helps us to check the technical search engine optimization properly, Creates a XML sitemap on its own, It edits the .robots.txt file and .htaccess file itself, social integration, multi-site compatibility and the best thing is that you can use Yoast SEO in your language. You can check the Image below for its working. Well, I think if more than half of the bloggers use Yoast SEO then rest of the Bloggers are using All in One SEO Pack Plugin to do SEO for their blog. It almost has the same features as Yoast SEO but is used differently and have a different graphical view. And this plugin can be used in 57 languages. Commenting Plugin is one of the essential WordPress plugins. If your blog doesn’t have a commenting system on your blog, then your blog can’t be called a blog but will be known for a website that provides information about something. Although WordPress has its own commenting system, you can add another to enhance the features or to get more comments on your Blog. This plugin is best known for making backlinks to the blog. Even I am using Commentluv Plugin on my WordPress blog. You may also use this plugin to get backlinks to your blog. But the links will be Dofollow or Nofollow this will depend on the blog owner. Although, I have collected a list of Commentluv blogs which you can use if you wish to use this Plugin for your Blog. It is another one of the most popular and essential WordPress Plugins. I do believe that this plugin is more used than the CommentLuv Plugin. I have seen the plugin on many big sites with domain authority from 80 to 100. I don’t know that this plugin helps to increase domain authority or not but it is used by many, and many bloggers are getting more traffic due to this plugin only. Although, the owner of the plugin claims that comments made through this plugin are Indexable which is good for the SEO perspective. Now it’s your choice to use one commenting system from the above two. Some of the best commenting Plugins for your WordPress Website. I will be sharing with you the plugins for creating the forms for your Blog. And three of them are really good. It is the easiest and one of the essential WordPress Plugins used by a wide range of blogger. It is totally free and can be easily used by non-developer also. Using it, you can create as many forms as you can use. It is so easy that you just have to copy and paste the shortcode on the page where you want to display the Contact form. Gravity Forms are really good. There are some of the extra things which you can do with Gravity forms instead of doing it with Contact us form. I have crafted a post on Gravity form. You check that “Review of gravity forms and complete guide about it.” I am sure It will be a great help for you. It is little more advanced. You can add more than a dozen of fields to your form. There are no limitations for emails, forms, actions, submissions, and forms. But the only thing is that it is paid. But you can try it for 14 days without any difficulty. Even it allows us to use its add-ons for free during the trial period. But at the end, I would recommend you to use Contact form 7 if you are looking for a completely free plugin. For making your Blog mobile-friendly, there are two plugins which I will suggest you install on your WordPress. As you must be knowing that Google recommends AMP (Accelerated Mobile Pages). So, there are plugins for the same. As I stated that AMP stands for Accelerated mobile pages. This Plugin helps you to make your WordPress site mobile friendly. You need not write any code for it, just install it and your Mobile-friendly pages are ready to go. Now this plugin which is a part of Yoast SEO and is also important from SEO perspective to use this plugin. The job of this Plugin is that accelerated mobile pages get proper SEO metadata from the main Yoast Plugin and the Accelerated mobile pages remain SEO friendly too. Although WordPress is a blogging platform, the developers have taken it to the higher level. So, that means we can easily make an E-commerce website using Plugins only. If you are using WooCommerce for your WordPress website, then you can sell anything online. It is a completely free plugin. It is World’s one of the best and the essential WordPress plugins which give full control to the developer as well as store owners to manage it properly. Some of its best features are that you can sell anything anywhere, you can ship wherever according to your will. More importantly, there are extensive payment options like it accepts PayPal, credit cards, cash on delivery and direct bank transfers. For Blog, Sidebar is one of the really important things. So there must be good widgets which attract the visitors and help them to find things easily. Even I have subscribed to many blogs to increase my knowledge, and I think if you are providing good information then your blog visitors will surely subscribe you. So, I will be sharing two plugins here too. It allows you to display your popular post, recent post, comments and tags all in one widget. Even I am using this Plugin from the day I have started this blog of mine. You can see the below screenshot for the same. Every Blogger needs a subscribe button or popup or a widget at the sidebar. And I assure that there is no other subscribing plugin which looks better than this and attracts the subscribers. You can also check the image of it below. There may be tons of Sharing Plugins available, but I will share with you the two plugins only which I used and are free of cost. This plugin helps to share your content on more than 80 social networking sites. It can be placed below or above the content, and even you can use this as floating sharing buttons on the sidebar of your post. More importantly, you can select size and style of your sharing buttons according to your will. The plugin is also responsive and also works well on the mobile devices. Is almost like AddThis buttons but differs in some ways. Here we get the option of sharing with more than 100 social media sites and apps. It can also be placed after and before content and also it provides the options of sharing the buttons vertically and horizontally on Floating share bar. It is also mobile friendly and doesn’t lower the speed of your website. And the best thing is that it supports the AMP pages of your blog which results in better user experience and ranking. It is one of the ranking factors in Google. If the speed of your Blog is Slow, the then chances are that your blog may not be given much preference instead of the other blogs which have better speed than your blog will be ranking better than you. So these are the plugins which help in speeding up your blog which becomes an essential plugin ever. This Plugin works on caching. I have been using this plugin for years to speed up my WordPress websites. It is compatible with dedicated servers, virtual private servers and even shared hostings. It also supports the mobile pages. There are many things which can help to speed up your blog. Another plugin which lowers the speed of your website. What it does is generate static Html files instead of dynamic WordPress files and make the speed of your Blog faster. Using it, you can compress pages, rebuilds the cache and some other things to speed up your blog. A complete guide for speeding up your WordPress Blog. There may be an opportunity when you have to create a photo gallery on your blog. I thought of sharing a free plugin with you so that you can create a photo gallery easily. The NextGen gallery is not only designed to create some galleries for your blog or website. It can do a lot more than that. It can be used to make a better website about photography. This plugin was created in 2007, and till now people are using, and now there are almost 1.5 million downloads. Its basic version is good enough, but pro features are amazingly good. It is simple to use and implement. It is really important to have a backup of your website. So, that you can recover if anything happens in between. But there is a plugin which can help you to completely take a backup of your WordPress website. We can say that BackupBuddy is one of the essential WordPress Plugins. It can help you to create a full back of WordPress website. You can back up your pages, settings, themes, Database, all your posts, Plugins, Comments, Users, media library, widget, all files and directories and even WordPress Core. Is an amazing plugin which can help you save all your images, posts, pages and all the other things in one place. You can save your file to Dropbox, Google Drive, and even the backup can be sent to your email too. It also has pro version which can you get for just $27 with some extra amazing features by signing up. There may be tons of plugins for monetizing ad networks. But I will share the two which I have used and which have worked awesomely well for me. This is really an awesome plugin. With the help of this plugin, you can insert ads in your blogs anywhere. More importantly, it helps you to insert ads in all your post at once. You can show the ads at the beginning of the post, in the middle of the post or at the end of the post. And this plugin has also helped me to reach $100 using the Google AdSense network. This also like somewhat like Quick AdSense. With some simple tags, you can add ads anywhere in the theme template. You can simply place the ads at the Bottom, top, footer and Random ads. Now, this is the Plugin which every WordPress user must have. Because it contains so many tools in it and alone can be used instead of many Plugins. There are total 28 features that this one Plugin provides. There is a long list of tools like beautiful math, Carousel, Comments, contact form, Custom CSS, Custom content types, enhanced distribution, Extra Sidebar Widgets, Infinite scroll, WordPress likes, Omnisearch, site stats, sharing, publicize related post, data backups and much more. Jetpack provides us many features and helps us not to install multiple plugins for getting the same features. But instead, we can get many features with a single plugin. There are some plugins which are important but can’t be categorized under the above sub-heading. This plugin also helps to lower the speed of your WordPress website. It actually reduces the size of all the images and hence improve the performance of the website. This plugin is completely free and can be used to resize and optimize images. It also has the capacity to Smush all your images at once and makes the speed of your website faster. This can be another SEO friendly Plugin which helps to get rid of the broken links on your blog. It can detect broken links from posts, pages, and even comments. And the best part of using this plugin is that whenever it detects a broken link, it automatically sends an email to the admin about so that the broken link can be fixed as soon as possible. Taking care of the broken links is considered as the Good practice of SEO. This plugin is mostly used when we are making a Parallax page in the WordPress. It has simple drag and drops feature which makes it user-friendly. I have used it many times and is good enough to be used by a non-developer. No coding is required to handle this plugin, but I use this Plugin when I am not in a mood to write code, and it is SEO friendly and works amazingly well. This Plugin is part of community site named Triberr. This plugin helps to post the latest post on your blog to publish on Triberr and Triberr community helps to get more shares for the post through the social media sites. I have written a post that how you can promote your blog using Triberr. I did not know about this plugin, but one of my friends named Enstine Muki told me about this plugin. And this Plugin is really good and helps to show your draft post to your friends without actually publishing your post. So, I thought it could be one of the essential WordPress Plugins and can help you to promote your blog post without actually publishing it. I would have listed this plugin in the above sub-heading. But I completely forgot about the security of the WordPress. I know this is one of the essential WordPress Plugins that every WordPress user must have. It helps you to enhance the security of your WordPress Website. It provides the accounts security, Login security, database security, file system security, Blacklist functionality, user registration security, Firewall functionality, security scanner, comment spam security and many more services. So, I recommend you to install this Plugin for WordPress for sure for the better security of your website. I wouldn’t have added this Plugin to my list of essential WordPress plugins. But Someone copied my whole post and pasted it on his or her blog. For the first time, he removed the copied blog post, but again he copied two more blog post, and this thing irritated me, and I was looking for some solutions but rather than the solution, I decided to take precaution. So, I found this amazing plugin which does not allow to copy the content from my blog. As soon as I installed this Plugin, I was happy and felt secured. It doesn’t even allow the other user to view the source code of website or blog. This is the most comprehensive security plugin that we have come across and we can’t recommend this to you enough. MalCare was developed after analyzing over 240,000 WordPress websites and it uses this collective intelligence to protect a site. MalCare offers a powerful malware Scanner and Cleaner along with robust Firewall. Other notable features include Site Management, Site Hardening, White-Labelling, Client Reporting, and Backups. The array of powerful features makes it’s a must-have plugin on your WordPress site. Why must you customize your WordPress Blog? 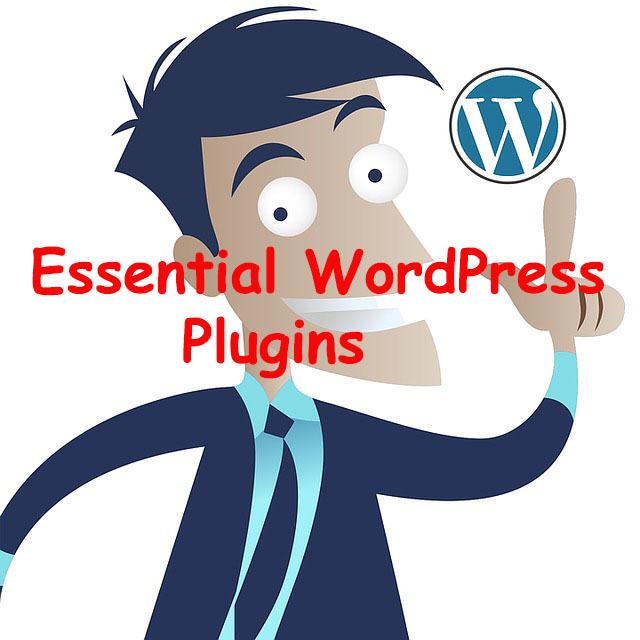 All the above plugins that I have shared are the essential WordPress Plugins for me. And I can’t run my blog successfully without these plugins. So use and enjoy this list of plugins. And do let me know through your comments that which are the essential WordPress Plugins for you. I am sure that your opinion will make this post more valuable. Why Use WordPress For Your Website Or Blog? but some I did not know about and would love to try. On exception – I had WP Smush on two of my blogs and this plugin did not work well with my other plugins. My sites were down for a few days and when I tried to remove it as per my hosting’s suggestion, it completely messed them up again. I ended up just leaving it there and not touching it. You do have to be careful. Will share your article . Excellent info. I haven’t faced any issues with the WP smush yet but thanks for sharing your experience with us. Hi Robin, this is a great list, thank you. I use many of these but am interested to read about the broken link plug in. I worry about broken links. I know many of my old posts will have broken links in them and it’s a big job to go through everything. I will take a look at this, thank you for sharing. Surely, broken link plugin is going to be a big help for you. Great article bro. These plugins are essential for who are running a wordpress blog. Using these plugins can increase productivity and performance of your blog. I am using most of them but still many I haven’t tried. Recently, I started using Comment Luv. And I am loving it. I am glad that you are already using these plugins I have mentioned. And comment Luv is amazing and can be used to get more comments. You wrote very useful article. I am using only 5-6 plugin that you have shared. But now i will use more plugin to improve my blog. Thank you for sharing a great article. These WordPress Plugins are very helpful, but in this collections I have seen some new plugins and usage Thanks A Lot for shared. I am glad that you have seen some new plugins. You compiled a very good list of the much-needed plugins. Regarding the discus plugin, I also noticed that it has been used by many popular bloggers. I am thinking why I should have a try using it for some time and see the difference. Thanks for sharing one more valuable post. Yeah that’s also a good plugin, you can give it a try. And thanks for your feedback. There are many plugins in the WordPress directory and people get confused which one to use or not. Blocking the spam comments is a headache. Akismet is the solution. The contact form is one of the most important pages of your website. I have used the contact form but did work well. A great post indeed. This is very informative post about essential wordpress plugins. First you define plugins then mention some essential plugins. Describe plugins which are very helpful to get rid of spam and seo friendly plugin. No doubt these are helpful for blogging. Yet another informative piece from TrickyEnough. You presented the essential plugins for a wp user. in that case, what is the limit, if I use more plugin will the loading or opening speed of the page will reduce or any other problems we face more usage of the plugin. When it comes to plugins I am still afraid of an experience I underwent a few months back. after embedding a plugin my whole page went down and later by the enquiry with the experts and the hosters, i came to know that it is because of an outdated plugin. Hey, will we know that the reliability of a plugin if someone creates it? How do we know that its safe to use? It’s really great to see you here on my blog again. And also thanks for the kind words. And there must be some plugins which could affect the websites speed or coding but a number of plugins installed in the WordPress don’t matter, one may face difficulty due to incompatibility or some other issues. And I have copy protected my content because There are was a person who was copying my whole posts and using them on his blog. So, I used the plugin to copy protect my content. Surely Akshar I will try to keep on updating this list. You shared a really amazing post here by exposing us to some really cool plugins capable of making our blog make sense and as such go viral. I know and have installed some of these plugins and I must say they’ve really made my life as a blog very easy. I have shared your post with my social media friends and just hopefully they will love and come back here to make a comment on your blog. Do have a great time over there! You’ve collected a batch of WordPress plugins here. Actually, I love the image optimizer plugin, but installed ready over 24 plugins on my blog. Thus, I did a bit hard working by manual optimize the image for post. I use Adobe Photoshop CC and online image optimizer. The most important plugin, you mentioned here is Backup Budy. You know? I lost over 90 article when the blog was hacked. I didn’t backup at the time thus it hard to recover the old post. It made lots of broken link. Thanks for sharing, I think this article so useful for fresh install bloggers. I will share the article and hope others will benefit from your list. I am glad that the post was helpful. And thanks for sharing it. Have a good weekend. Great list i am using many of these plugins and these plugins are simple to integrate. Thanks for this great article WordPress plugins, You have listed all important WordPress plugins which is very useful and essential for all bloggers. You should mention ‘WP Optmize’ plugin. This is really great plugin to keep your database optimized and light in weight. Surely, I will add that plugin to my list as soon as possible.